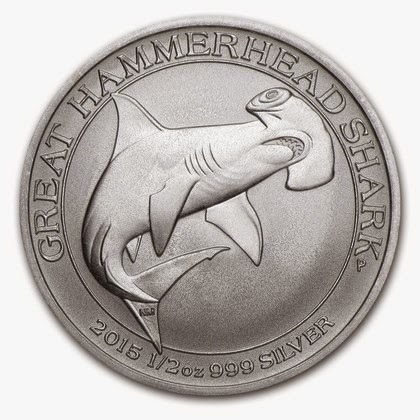 The hammerhead shark is one of the most recognizable creatures on the planet, and the largest of the species, the great hammerhead shark, is now immortalized in Silver. The Perth Mint has introduced the second release in their Shark Series celebrating this unique and unmistakable hunter. Each of these Beautiful Uncirculated (BU) coins contains 1/2 oz of .999 fine Silver and exhibits a beautiful representation of the strong great hammerhead shark swimming through the water. The coin displays the Silver weight and purity, providing assurance of the high quality of each coin. Since opening in 1899, the Perth Mint has produced and refined large quantities of Gold, Silver and other Precious Metals. Multiples of 25 come in a tube. 500 coins will come in “Monster” boxes. Individual coins come in a plastic flip. Second release in the APMEX exclusive® Perth Mint Shark Series. Reverse: Features a great hammerhead shark, surrounded by the name, weight and purity, along with the Perth Mint’s “P” mintmark.